This is precisely how I feel. I am blessed to be a homemaker! I've read this before. I love it! Oh, I needed to read this today...over and over again! I love this and I totally agree. Thanks for sharing it. I've seen this before and it's just as good the second third times around. gag. get a job, get some passion, get a life. there's a whole world outside of your kitchen, and it can be thrilling. sickening that some women still feel this way. Your life consists of reading a Homemakers blog, and you say "gag". Dear me! Thank you so much for posting this quote, it sounds soooo dreamy! I'm in love with my bridal portraits that you took the other day, I can't get over how beautiful they are! We had so much fun, laughing and being silly! Thanks for being such a great friend, you've added such joy to my life! I love this quote...I agree 100%! Beautiful! 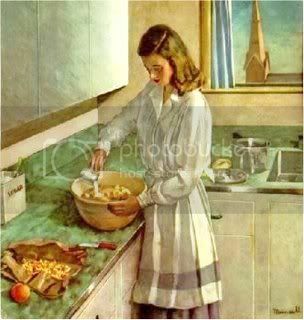 Being a homemaker is a honor, priveledge and a job. I enjoyed my 4 hours years of taking care of our family and home. Thank you for sharing this. It never gets old. You said "gag. get a job, get some passion, get a life. there's a whole world outside of your kitchen, and it can be thrilling. sickening that some women still feel this way." What exactly is so thrilling that you think I am missing out on? I DO have a job- I take care of my home and my family. There is no one else who does it exactly the way I do it. I DO have a passion- serving my Lord and Savior Jesus Christ!! I DO have a life! I have a WONDERFUL life that I am incredibly happy with! I couldn't ask for more!!! TRULY!!! What is so sickening about women being happy to take care of their families? Mrs. U., If you do not want that anonymous comment, I wonder if you would allow me to have it. It would work quite well in a collection of comments that my daughter and I have, that are equally silly. We could get a lot of mileage out of this one.Since it was posted anonymously, I assume it has no copyright, and maybe it could be useful to shed some light on the beliefs that homemaking is not worthwhile. Victoria... I love a good period drama!! !